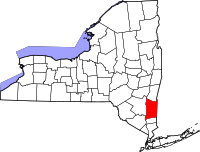 Dutchess County is a county in New York, United States. It is in the Hudson Valley. This page was last changed on 24 September 2018, at 16:04.